Since a young age my inner voice took me on a journey to find ‘inner happiness and calm’, knowing I can find it. Early on, my spiritual path led me to meditation; over the years I acquired different techniques and saw the changes within me. When I stumbled across my first Ashtanga Yoga class the pieces fell together, and since nearly 20 years I am walking the yogic path. Meditation showed me the entrance to my home, Yoga. Through Yoga I've learned about the inner facets of my being, and I believe from my life experiences and long time work as a yoga teacher, that we can all find a way out of darkness to freedom through yoga, by being open and curious and not shying away from emotions. I am teaching yoga over 15 years. I lived in Mysore India for a year to study with my teachers the late Sri K. Pattabhi Jois (†2009) and his grandson Sharath Jois. I regularly return to Mysore to study and to be inspired. I am a Level 2 Authorised Ashtanga Teacher from KPJAYI Mysore, India and have a diploma in Yoga Anatomy. I am trained as a Yoga Therapist CNHC and Yoga Nidra teacher and I'm registered as a Senior Yoga Teacher (SYT) with Yoga Alliance UK. Yoga works like a mirror, on our yoga mat our personality is being reflected, with all the good and bad. As a yoga teacher I support each student in their process of healing through encouragement, challenge and space. I always try to inspire students to follow their inner voice to experience their potential. A regular yoga practice mirrors our own patterns over and over again, until we acknowledge them and can leave them behind us. Yoga does not only lead to a healthier lifestyle but also fulfils the desire of inner freedom. One of my goals as a yoga teacher is to reach people who can’t join a yoga group class. I want to make yoga accessible to everyone, which led me to train as a Yoga Therapist (Complementary & Natural Healthcare Council Registered). As a yoga therapist I work with people mainly one to one. Yoga Therapy is the adaption of yoga practises for people with health challenges. By integrating the mind and body, balance can be restored to the physical, physiological and mental/emotional system. Therapist analyses and addresses the needs taking into account physical, energetic, mental emotional and spiritual aspects. 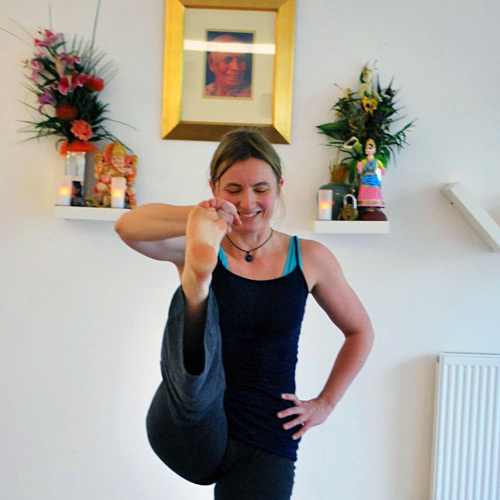 In 2010 I fulfilled a long-desired wish and opened my own yoga studio in London ‘Yoga Creation’. With a team of wonderful yoga teachers we built an oasis, which allows our students to feel welcomed. There is space for students to grow and to find support, where each student can walk the path of self-healing within a supported environment. I took my first yoga class in January 2001 and was hooked immediately! I began practising for a variety of reasons including: to relieve the ever increasing tension in my neck and shoulders, to help with an on-going health condition and to develop a greater spiritual awareness and understanding of life. I am pleased to say that my practice since then has helped with all of these things and much, much more. It has brought me great joy, taught me great patience and helped keep me grounded through life's highs and lows. From being an avid and devoted student I went on to complete a four year Aurolab Yoga (500 hour) teacher training programme in 2006, whilst also building my own daily ashtanga yoga practice, as well as studying with many great teachers both in the UK and overseas during this time. I came to the practice of yoga without any previous physical training in disciplines such as dance or gymnastics, and the strength and flexibility that I now have all come from a regular and dedicated yoga practice. I strongly believe that anyone, whatever their physical background, can gain great physical, emotional and spiritual benefits from a regular yoga practice. 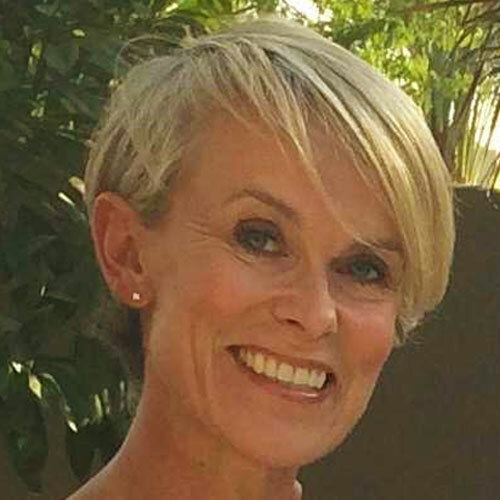 As I started out with so little flexibility I very well understand the challenges that people can face when first beginning a yoga practice, and as a result of my own experience I am very well equipped to help people of all abilities to develop and improve their practice in a safe and careful manner. I have practiced with and learned from many wonderful teachers over the years, including a three month stay in India studying with certified Ashtanga teacher Rolf Naujokat. I was also very privileged to study directly with Sri K Pattabhi Jois on two occasions, and to experience his amazing presence. My practice and my teaching have also been greatly inspired by the extraordinary Dharma Mittra, who is based in New York, and who I have been fortunate enough to study with on many occasions. My practice and teaching are continually evolving, as I explore, study and deepen my knowledge of yoga and all that it has to offer. In 2012 I trained with Sarah Powers to teach Yin Yoga and Mindfulness Meditation at the Kripalu Center in the US, which has really enriched both my practice and my teaching. And more recently I have deepened my understanding of yoga for pregnancy, birth and beyond by training with Francoise Freedman and Birthlight to achieve a Pre and Post-Natal Yoga Diploma. I would particularly like to thank the following teachers for their help, encouragement and guidance over the years: Angelika Grohmann for igniting my passion for yoga and for continuing to be an inspiration; Sharon Matarazzo and Eileen Gauthier for taking my practice to a whole other level; and Charlie Taylor-Rugman for teaching me so much and sharing his very great knowledge of, and passion for, both yoga asana and yoga philosophy with me. I am also indebted to all of my students, both past and present, from whom I have learned so much. I very much look forward to sharing my great love of yoga, and all that I have learned along my journey so far, with students at Yoga Creation. My very first contact with yoga was at the age of 9 when a cousin took me to one of the well known classes in Serbia led by former ballerina Jasmina Puljo, and from that first experience yoga never left my life. I enjoyed Ashtanga classes while living in Canada and engaged in Hatha and Iyengar actively upon moving to the UK in 2001. 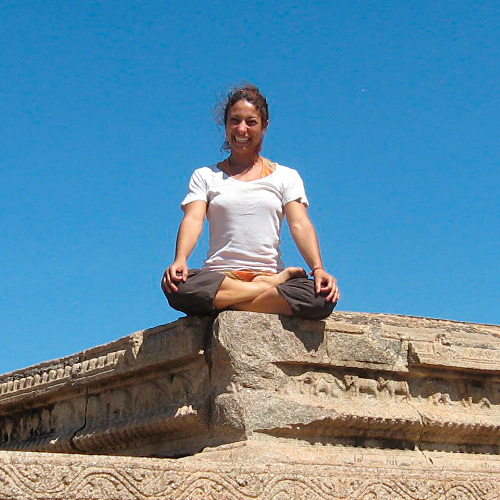 7 years later I relocated to the Middle East which enabled me to achieve my desire to commence Yoga professionally. After I attended the Yoga Alliance 200 teacher’s training course in Thailand with an Australian school Santosha , I regularly returned to Asia or UK for workshops and additional training, taught and inspired by many teachers such as Peter Clifford, Jonas Westring, Bridget Woods Kramer, Zoe Trenwith and the Anusara classes in Rosemary’s Wild Rose Studio in North Thailand. Most recently I have been influenced by the mind-body healing approach of Bo Forbes as well as focusing on opening our heart centres, thus letting the joy of what we genuinely love guide us through life. This inspired me to complete intensive Yoga Therapy Course with Om Anandji of Paramanand Institute in India as well as Bo’s integrative yoga therapeutics involving the mind-body network in teaching. Our bodies express feelings and thoughts which cannot be spoken or heard, thus I dedicate my practice to inspire others to become aware of their secret gifts, music and dance they carry within. My background in languages and literature, inter-continental life experience coupled with my former fast-paced fashion retail career, help me understand how great the demands are of today's busy lifestyle, thus leaving little fun yet effective time for ourselves. By integrating traditional Hatha style and timeless wisdom with modern approach to gentle or dynamic practice, I encourage everyone to learn about themselves and to use the skills learnt on the mat in their daily life. I relish the opportunity to continue my yoga journey with the students of Yoga Creation and to be part of such a welcoming serene space where the love of yoga can be shared. I have found Yoga through dance in 2000 in Athens, where I was studying and trying to recover from a long lower back problem. After my first class I felt the freedom, that I've had never found in any physical exercise before. Since then I have been practising different styles of Yoga, fell in and out of love with so many of them and finally found my home in Vinyasa Flow. "Why Vinyasa Flow?" people ask me… because in my mind all actions in life are meant to be Vinyasa, synchronized breath with movement! The Flow classes I teach are influenced from Dance, Martial Arts, Swimming, Alexander Technique and Ayurveda! You might think how can you combine them together in just one Vinyasa Class! Well you can! With love and understanding for the individual, always moving forward with attention and intention. Like it is said in Quantum Physics, if you give your awareness to the simplest action, the quality of that action changes! I have been blessed with so many teachers from my young years till now. I have received my 200hr Certification with Lara Baumann and my 30hr with Cameron Shayne in Budokon Yoga (a unique style, that blends Martial Arts with Yoga) and 30hr Yin Yoga training with Norman Blair. I also teach kids from age 3 to 7. After years of doing ballet as a child, I was looking for something that I could lose myself in. Something that would make the chatter in my head be quiet for a minute or two! Once it turned out that offices, pubs and gyms didn’t do the job, I tried a yoga class at my local gym. It was pretty much love at first downward-dog. 16 years later, I am a 500 hour certified Yoga Teacher with Yoga Alliance, having studied with Yoga London in the UK and Sampoorna Yoga in India. I have learned about Ayurveda, meditation, philosophy and anatomy while travelling through Asia too, and try to bring a taste of this Eastern knowledge to bear in a my teaching and practice. I first began to practice Yoga 6 years ago to support my athletic training. I was fascinated by yoga philosophy and my interest in the healing benefits of yoga led me to a long journey to India. I've been lucky enough to meet my Guru in 2012 in Allahabad. During that time I established a deep connection with the roots and tradition of Indian Yoga and meditation through months of daily practice. I now practice daily Mysore style Ashtanga with Hamish Hendry and I continue my study as a remedial sports masseur at the NLSSM. Passionate about yoga as a tool for healing I like to encourage a meditative approach to the practice, my classes also include great emphasis on healthy alignments, breath work and mindful body awareness. With love and gratitude to all my teachers. My career has always been related to health. In Lithuania I was an editor for a health magazine, and after that I worked for a British health care company. But it was my interest in holistic therapies that set me on the path to yoga. After holistic massage helped cure my chronic back pain, I was so amazed by this that I decided to train as a holistic therapist and set up a part-time business. Soon after, I discovered yoga and Pilates and realised that yoga is like self-massage. At this point – more than a decade ago – I started to develop my regular diligent yoga practice, inspired by many great teachers and learning from many styles: Hatha, Iyengar, Vinyasa, Ashtanga, Yin Yoga. I hold Level 3 Diploma in traditional Hatha Yoga with CYQ and Yoga Professionals (Sujatha Menon and Conrad Paul), 500hr IYN certified (Registered Independent Yoga teacher). Also I studied Yoga and Stress Management with Swami Jyotirmayananda, Yoga Therapy (including Meditation and Yoga Nidra) with Doug Keller, Restorative Yoga with Judith Lasater, Yin Yoga with Norman Blair, The Art of Vinyasa with Richard Freeman and continue to study. In addition, I hold an ITEC Diploma in Holistic Massage, a Postgraduate Diploma in Aroma-Stress, and Certificates of Professional Training in Ayurvedic Therapies, Reflexology, Stress Relief Massage and Reiki. Yoga always helped me through the difficult times of my life. It has saved me from the chronic back pain and helped to deal with severe stress. I have gained a lot of physical strength and flexibility as well as inner peace, calmness and optimism. I learnt to live in the present moment and enjoy it. I wish everyone found the great path of Yoga. I discovered yoga as a way to heal my back pain and it became my passion. 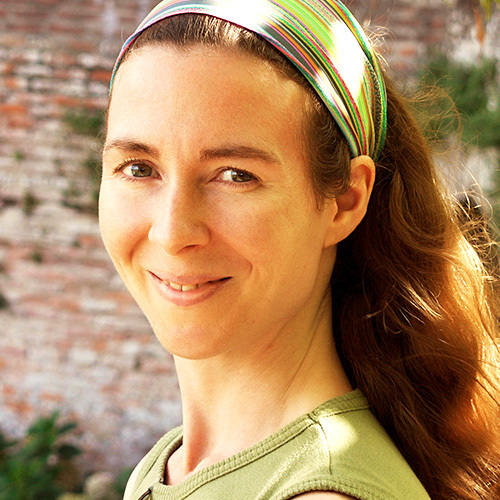 I began teaching in 2008 in a traditional hatha yoga lineage after taking teacher training in India in 2007. Over the years, I branched out into other styles, training and teaching extensively in yoga nidra, hormone yoga, kids’ yoga, and lately pre- and postnatal yoga (with Birthlight). I also teach Vinyasa and Yin, which complement each other perfectly. I have lived and taught in France, Spain and Italy before recently moving to London. The aim of my classes is to show students how to use the simple, yet profoundly effective yogic tools of safe movement, breath, relaxation and meditation in their everyday lives so they can heal and thrive. I have always had a keen interest in all sports and fitness. From an early age I practiced gymnastics to County level my inspiration coming from Nadia Comaneci. So the natural path for me in adult life was going to be fitness related and to learn more about the human body, how it works, its musculature, posture and movement patterns, so I became a Personal Trainer. Having had a fitness background for over 20yrs which I have loved, my body just wasn’t feeling as it used to so I wondered how long I could keep pushing myself to this level injury free! So my yoga journey began. I had dipped in and out of yoga over the years trialling different styles and teachers but it wasn’t until my friend introduced me to Mysore style Ashtanga that I embarked on a regular practice and totally fell in love with yoga. I soon realised that although perhaps I began yoga to fulfil my physical need through my asana practice it became clear that yoga had so many other benefits, life can be difficult sometimes so yoga for me taught me now to cope with everyday challenges, it also made me realise how amazing life can be now I am looking at it in a different way ‘the glass is half full not half empty’. I realised if this is how it could make me feel how could I help others, so I embarked on my yoga journey and became a qualified 200hr teacher in the hope I can pass it on. Since then I have continued to learn and grow attending further courses and workshops to enhance my knowledge. I find inspiration in sharing my yoga through teaching and my intention is to help others incorporate a daily practice whatever the time you have and whatever the level you are simply taking a breath and finding time on your mat is a great start. I am looking forward to meeting all my students and continuing our yoga path’s together. 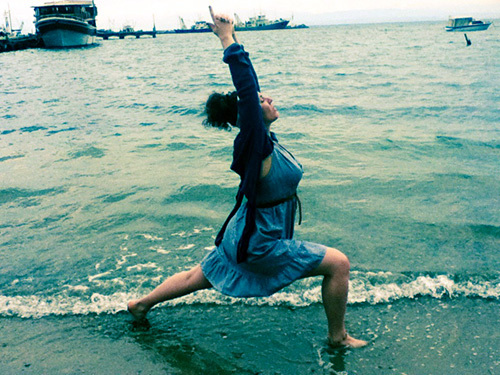 Teaching Yoga since 2009 has brought Alex great joy. Her influences are wide, her main practices have been Hatha, Ashtanga, Menstrual Cycle Awareness, Grotowski Theatre and Dance Meditation with the School of Movement Medicine. Her favorite Areas of Interest in recent years have been the: Spine, Pelvis and Uterus, Conscious Breathing, The Four Seasons and Spontaneity and Performance as a Yoga. Alex originally trained as an actor and is an artist in every sense; creative, empathic, sensitive, spontaneous, person centred and passionate in researching Yoga and the Art of Being Human. 3 year Diploma in Yoga with the The British Wheel of Yoga. 1 month Ashtanga Yoga at the Ashtanga institute of Sri K Pattabhi Jois. 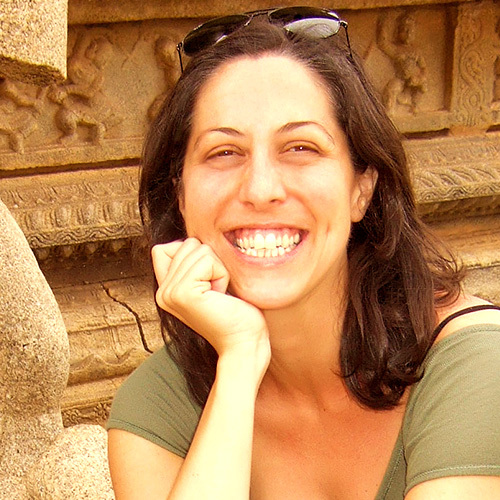 Olivia’s teaching style comes from the heart, she tries to inspire her students with the love and passion she feels for the Ashtanga Yoga practice. She keeps a high energy in her classes and pays close attention to the individual student, helping develop the student’s understanding of their own full potential, while allowing space for playfulness and fun. Olivia is currently working through the Advanced B Series of the Ashtanga Yoga System. 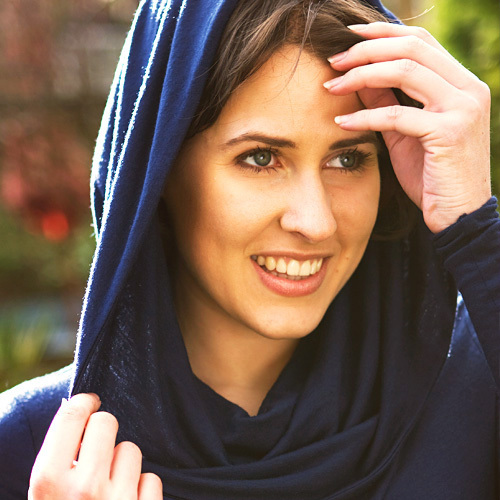 Kate started practicing as a distraction from a stressful job in the city five years ago. She quickly fell in love with how liberating, healing and fun yoga was, and through regular practise, was able to regain harmonious balance and happiness to her life. 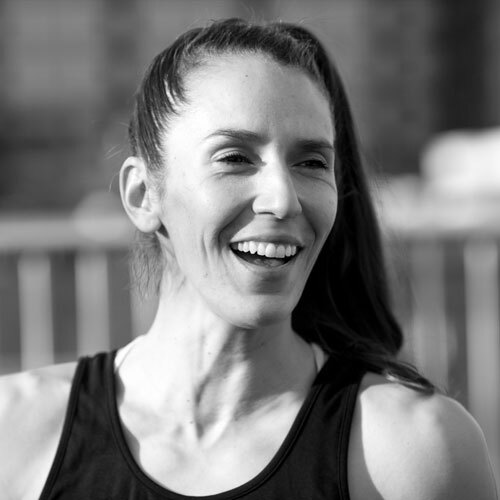 After training in India, she aims to inspire people to do the same - transforming their minds and bodies and ultimately, their lives in the process. 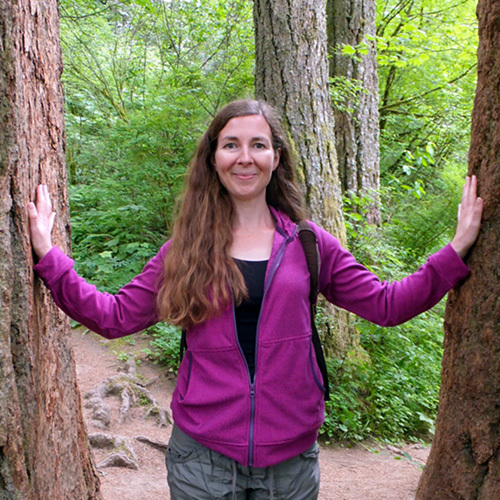 Amy was first drawn to Yoga over 15 years ago and has a background in Therapeutic Yoga, having first experienced the healing power of the practice while recovering from injuries of her own, and then becoming a teacher herself. 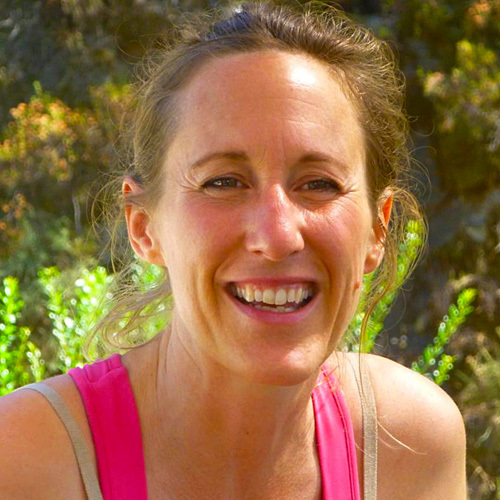 She has since taught and shared this transformational practice with groups and private clients from all walks of life and has also managed London based Yoga teacher training school: Teach Yoga, for several years. Her classes are warm, attentive, supportive and aim to encourage the development and realisation of her students' true potential. 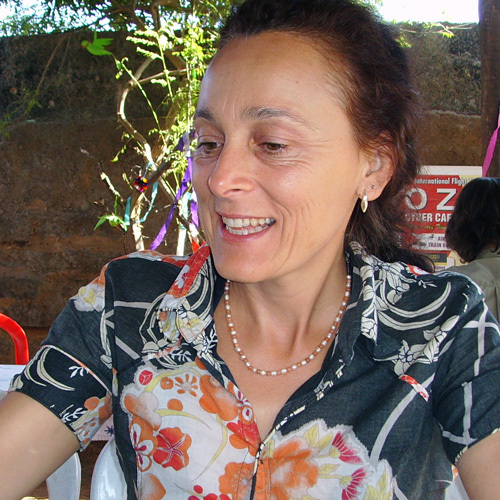 She has had many great teachers including Elena Voyce, Swami Saradananda, Krishnaa Devi, Shelley Shine, Joe Ross, Jesse Saunders & Tina Hardy and her teaching is particularly influenced and inspired by the work of Elena Voyce PhD, who was a pioneer of Therapeutic Yoga in the UK. 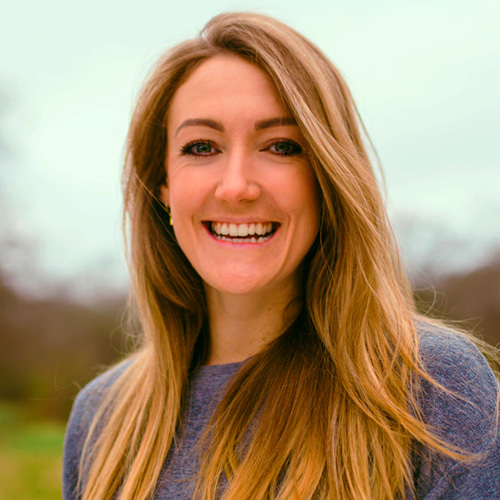 Amy also holds a Masters Degree from University College London where she specialised in 'East' - 'West' Philosophy and likes to find balance in all aspects of movement and life! I started practising ashtanga yoga in 2000 when I was living in London. I learned the practice at certified teacher Hamish Hendry's shala Ashtanga Yoga London and in 2005 I travelled to Mysore to study in the Ashtanga Yoga Research Institute (now KPJAYI). 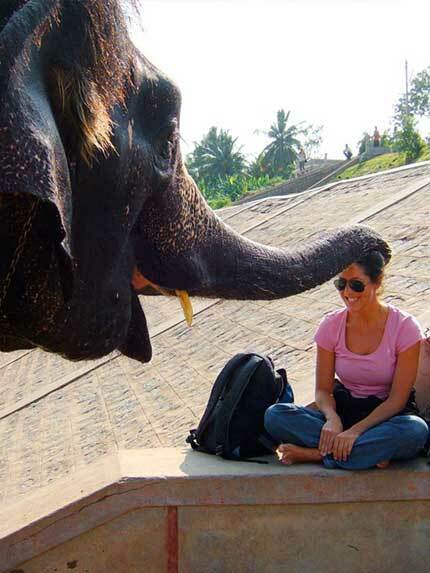 I ended up living in Mysore until 2009, studying with Sri K Pattabhi Jois (Guruji), Sharath and Saraswati. 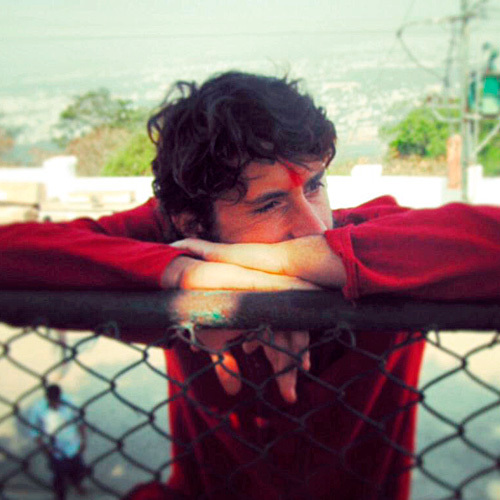 I've spent more than 30 months in the shala since I first went to Mysore, and Sharath is my teacher. I was authorized to teach ashtanga in 2009 and I participated in Sharath's workshop for authorized teachers in July 2010 and his special 2-month course for authorised teachers in 2014. I return every year to practice with Sharath and I have occasionally assisted him in the shala, too. I also study chanting with Dr. M.A. Jayashree and Indian philosophy with Prof. M. A. Narashiman in Mysore. I have been teaching ashtanga since 2008 and these days I travel and teach mainly in Europe and in Asia. 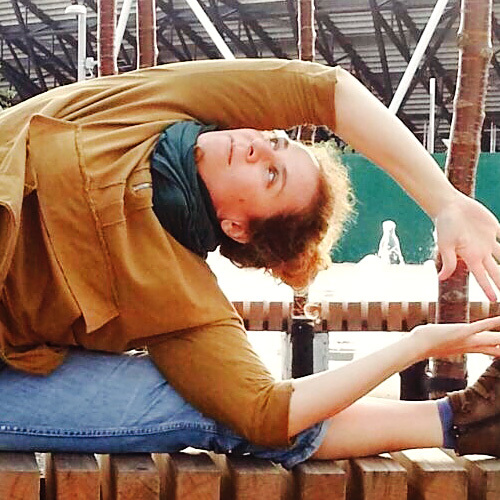 I’m looking forward to returning to Yoga Creation as a guest teacher! I’m an aerialist and a dancer, and I discovered Yoga in 2005, when I was introduced to it as part of my physical training for my performing activity. The benefits the practice brought to my body were almost immediate: I was able to build and maintain strength, develop stamina and increase flexibility; overall through the years, I grew a healthier and more sensible body able to quickly recover and prevent from injury. So, I decided to deepen my practice and share it with others. I started my studies in India, where I qualified as teacher at the Himalaya Yoga Valley and furthered them in England at the Yogacampus. My personal training and practice range from dynamic styles such as Ashtanga and Vinyasa Flow to more healing styles such as gentle Hatha, Restorative and Prenatal Yoga. I have extensive experience of teaching to both new yoga comers and regular practitioners, as well as children and families. Although my approach is very physical, Yoga is a holistic system and both in class and in life, I strive to develop inner balance, looking at opposites and how to bring them together. In 2011, together with three amazing colleagues, Daniela Essart, Jean Hall and Liz Lark, we started to share practises and expertises in order to create a form of yoga, which uses the principles of aerial to deepen the traditional ground based practise. After months of research and development, YOGARIA was born! 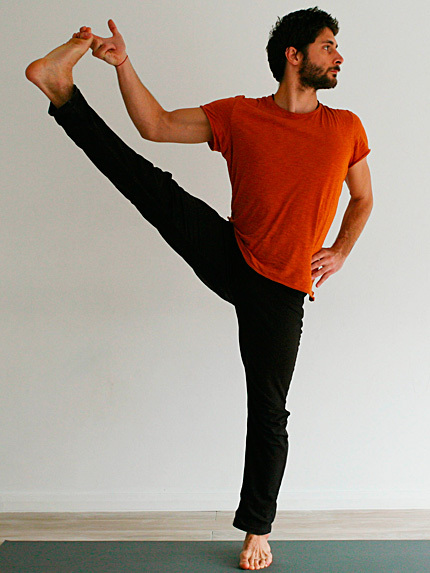 Jasone teaches traditional Ashtanga Yoga. She has had a daily Mysore practice for the last 12 years, taken part in many workshops led by senior international teachers and in 2004-2005 made an extended visit to the KPJAY of Mysore to study with Guruji, Sharath and Saraswathi. 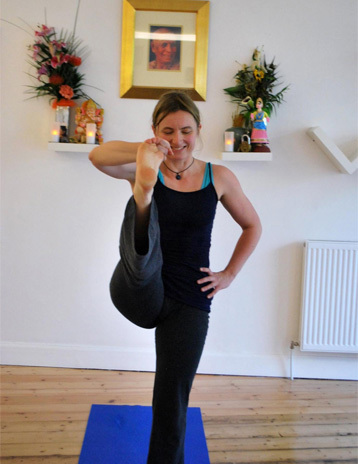 In London she practices under the guidance of Hamish Hendry whom she also assists and is committed to going back to Mysore whenever she can. Parallel to this Jasone teaches art while also practicing as an artist. 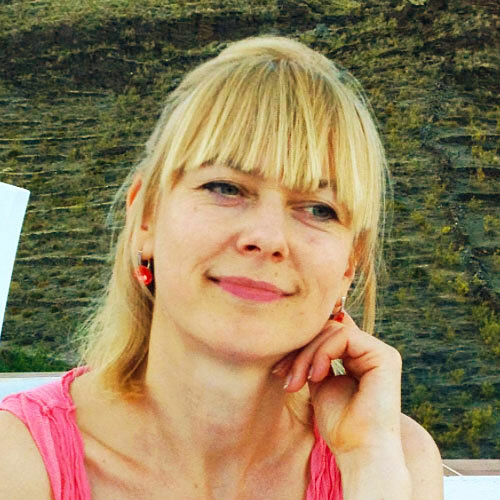 Her combined experience in yoga and art, practical as well as theoretical, has given her a particular understanding of how the body and the mind work in conjunction and the belief in the importance of exploring new ways of thinking and living. When teaching yoga her priority is to help students to develop their own practice by encouraging a quality of mindful attention that can be extended outside the mat.